Anthracite's extreme density gives it a particularly high energy yield while its combustion produces markedly less ash and soot than other forms of mineral fossil fuels. For this reason, it became a highly sought after fuel source... once it became understood. That is to say, anthracite coal is typically so dense that it can be very difficult to light... and once lit, it is often troublesome to keep burning without feeding a steady supply of air to the blaze. The blast furnace is a type of technology that allowed for the successful use of hard coals in industrial processes, for example. 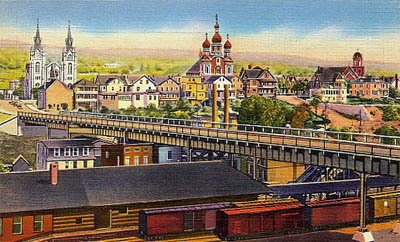 Centralia, Pennsylvania was established in the middle of the 19th century in Columbia County... right in the heart of the state's anthracite region. It quickly rose to prominence as a mining center, producing coal (much of which was shipped on the two prosperous railroad lines servicing the town) for the next 100 years. One of the tricky things about anthracite coal is that in addition to being difficult to get it to light, the exceeding density of the mineral makes it rather hard to extinguish after it has successfully begun to burn in quantity. 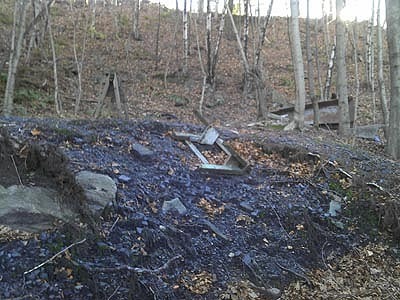 In the early 1960s, an exposed portion of the coal vein that runs beneath Centralia caught fire. The exact circumstances surrounding this accident have never been conclusively proven, but nearly all reliable evidence points to the possibility that the burning of refuse produced hot embers that either directly contacted an exposed coal seam or which were carried on the wind in great enough quantity to ignite coal that was exposed on bare ground. No matter the initial cause, the ultimate effect has been dramatic and devastating. The coal fire continued burning underground (many times escaping detection by locals as it snaked and wandered in various directions beneath the soil) without intervention until the 1970s, at which time the surrounding environmental and health effects became very prevalent. Thermal probes registered incredible temperatures just below the ground surface in numerous locations. 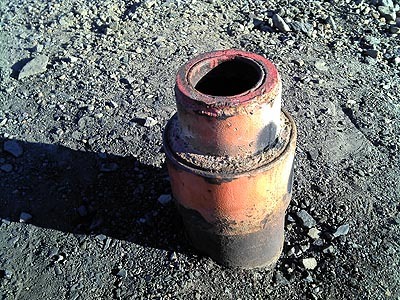 Perhaps most prominent among these sorts of discoveries occurred when a gas-station owner and then mayor, John Coddington, became aware of heat in an underground fuel tank. A thermometer lowered down on a string yielded the shocking discovery that the temperature of the gasoline in the tank was 172 °F. These sorts of readings, plus the occasional disturbance of the ground -- such as the near-death of 12-year-old Todd Domboski who was almost swallowed by a gigantic, smoking sinkhole -- garnered national attention. Despite efforts by engineers and geological specialists, no plan of action to extinguish or contain the fire was deemed to be financially feasible. The only money that governments were willing to allocate was for the relocation of the residents of Centralia and for minor measures designed to stabilize (and then later close) roads and public grounds in the town. Today, Centralia exists as little more than a ghost town. Most (but not entirely all) of the residents have relocated, and nearly every home and building structure has been demolished or reclaimed by nature. The town posseses an eerily spooky air, remaining only as a network of pavement and street signs that lay amid no evidence of population. 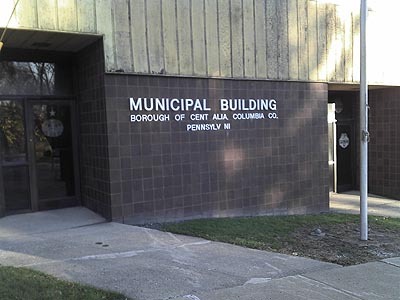 Almost the only man-made structures that exist now are the semi-derelict municipal building and vent pipes which have been installed in the ground at specific locations. 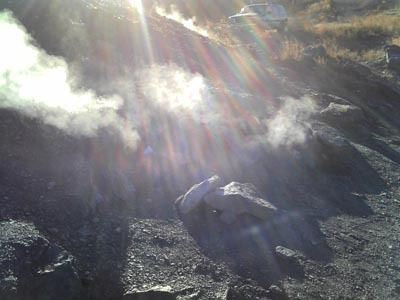 The coal fires still burn beneath Centralia, and depending on climate conditions it is often possible to see vast plumes of smoke and/or steam rising from cracks in the earth or rolling across fields and graveyards. Centralia, Pennsylvania has become something of an off-beat tourist destination. Many out-of-towners pass by to see a glimpse of the coal industry that once was (sometimes people are in the area to visit the popular museum and mining tours that can be enjoyed in neighboring Ashland, PA) and marvel at the still-smoking earth. By the best estimates that scientists have been able to produce, the coal beneath Centralia is likely to continue burning for the next 250 to 1,000 years. While visiting Centralia is popular, please note that this historic town still holds a very special place in the hearts of the locals... indeed, many folk from neighboring boroughs are former Centralia residents themselves who took the only option available to them and accepted Federal money in exchange for forced relocation. It is not uncommon for the people whom one sees walking dogs or hiking the trails of Centralia to be a stone's throw from their old land. Please keep all this in mind when visiting and do try to maintain a proper decorum and attitude. The town has fortunately remained relatively free of graffiti and litter, and those who visit are asked to help keep it this way. As you will see on many of the posted warning signs in the area, the still-burning fires continue to be a source of disturbance for the ground beneath your feet in Centralia. Also, the vent shafts, crevices, and pipes from which smoke and steam emanate are hotter than one might suspect. Persons who get too close run the risk of burns or exposure to toxic gasses. Those who enter proceed at their own risk. I have been fortunate enough to never feel the earth shudder or sink beneath the wheels of my truck (which is rather weighty) but that should by no means be taken as a sign that it is safe to walk or drive carelessly about. Drive with caution, stop your vehicle and proceed on foot if necessary, or simply stand put and take only photographs if you can't be certain of how stable the ground is. We at SendCoal choose to package and ship Anthracite from this region not only because it represents some of the finest mineral energy that the United States has historically produced, but also as a way to help keep alive the memory of this once-thriving town that has now become little more than a smoky whisper.